Articles > Imagine > "Goat-dragging"
The rules of the show are as follows: at the beginning participants locate a goat's body in the middle of the field, on a signal they try to grab it and take out of the specified borders. At the same time, other players, or “Chapandaz”, as they are otherwise called, strain every nerve to hamper the lucky one and take the trophy away from him. Entire families come to watch a goat being dragged. People get settled for a long time: they take sandwiches, make fire and warm up their tea. Sometimes the cruel game may last several days in a row. There aren’t too many entertainments in Tajik villages; they still have problems with electricity there. Not all of them have TV sets and radios, newspapers arrive with a delay. However at goat-dragging or “Buzkashi” as they put it, for instance, in Tajikistan, one can look and others and show one’s worth at the same time. Before the game a goatling five to six years old that also weights 60 to 90 kilograms is picked. A day or two prior to the competition the animal is decapitated and put into water, occasionally – salted. This makes the body very heavy and hard which means it becomes extremely uneasy to carry it. But Chavandazes do long and persistent practice. They achieve true masterhood in goat-dragging only by the age of forty. Horses are being prepared diligently, too. For games participation they are bought from special breeders when still stags and paid for as much as a couple of thousand dollars each. Years of hard training, high feeding and careful nursing are to follow. An experienced horse feels by itself when it is necessary to go around and push rivals away; and should its owner grab the body, it darts off galloping. Chavandazes are respected and well-off people because winners get fair prizes from carpets and color TV sets to horses, cars and money rewards. Despite their wealth, the participants do not have a special uniform. Some are dressed in short chapans, others – in thick wadded jackets and cotton wool trousers able to protect a participant’s legs from a horse’s bite or accidental lash stroke. Every competition has its sponsors. Normally it is someone who wants to celebrate wedding, conduct circumcision ceremony for a kid or show Buzkashi to visitors. It is them who cover all the expenses. Goat-dragging costs at least 200-300 Dollars with the goat paid for separately. On holidays such games are held everywhere: on big stadiums in cities and on small fields in distant settlements. 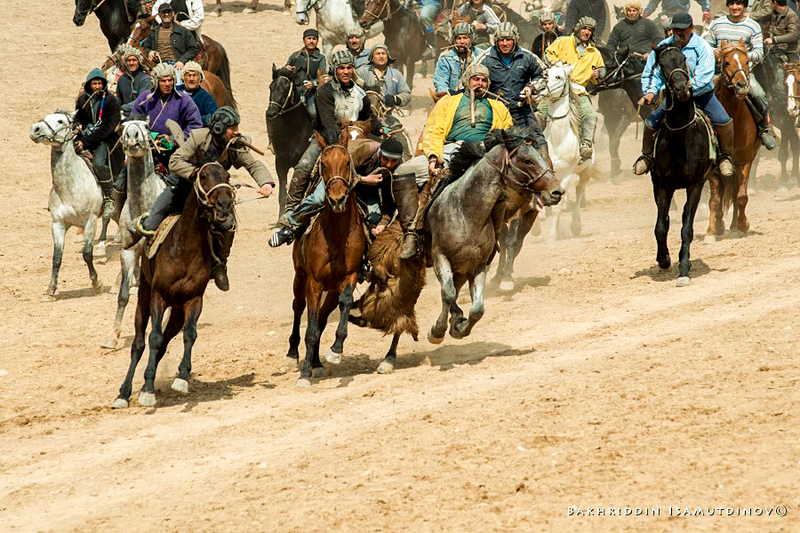 In Tajikistan even Buzkashi Sport Federation was found recently in order to develop the sport and participate in international tournaments.